Thank God that the Town Supervisor in Dunkard, Pennsylvania knows what is best for his town's residents. 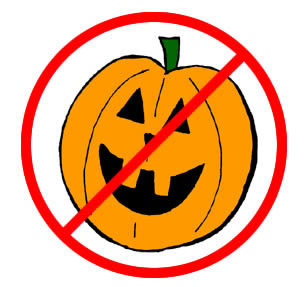 Local town officials have officially banned the practice of trick or treating in their town this October, and will host a 4 hour long Halloween party at a fire hall, instead. Assistant Fire Chief David Pritchard, surprised at all the negative feedback from his and fellow officials' tyrannical actions, listed a series of recent break ins as a safety concern that factored into the Town's decision. Because, apparently, when the little ones go out trick or treating, they force their way into your house after you've given them candy and commit robberies. Pritchard is currently running unopposed for election this year-- let's hope that changes, the next time around. "Supervisors in Dunkard Township say they are taking the steps for safety reasons. The party will be held at the Bobtown-Dunkard Volunteer Fire Station, but not everyone is pleased with the idea. "When they try to take away trick-or-treating for our children, we have to step up and fight back," Parent Michael Skumlien told KDKA-TV. "I think they're taking all the fun from our kids. This is a small town and our children need something," Freda Menear, a Bobtown grandparent, said. Hannah, a student at Bobtown Elementary School, said all the kids she knew have been talking about it and are disappointed by the supervisors' decision."